Nary a day can pass without a global headline reminding us why it’s still better to be living in America. New Zealand’s Prime Minister Ardern ( shown left) has outlined a host of draconian changes to their gun laws, in addition to imposing extreme censorship based solely on the actions of one deranged man. Even with the Christchurch shooting, New Zealand enjoys one of the lowest homicide rates in the world. The average gun-homicide rate is about 50 per year; and consider, this is in a country of 5 million that own about 1.5 million firearms! By any measure you care to use, Kiwi’s are extraordinarily safe from gun violence; so much so it should be a non-issue. Which makes me wonder… where is this impulsive action, this bizarre notion of urgency to ban guns and limit free speech coming from? Is this more about CONTROL than safety? The changes will greatly restrict possession of all semi-automatic firearms, ban rifles deemed to be a so-called assault weapon and impose new censorship that would make even the mere possession of a “hate speech” document, like the Christchurch gunman’s 72 page manifesto, punishable by up to 14 years in prison! Once again, we have dramatic evidence that freedom is a fragile thing, deserving of our daily vigilance, lest we find ourselves yielding to the demands of the far left in concert with the new Socialist-Democrats. This entry was posted in Civil Rights, Constitution & The Law, Gun rights, Terrorism and tagged Ardern, Censorship, Christchurch, gun control, gun rights, New Zealand, NZ, PM, shooting, white supremist. Bookmark the permalink. 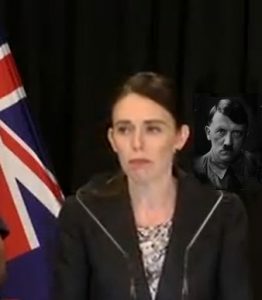 Anyone notice the resemblance between Ardern and Adolph. The dour look, the sunken cheeks, the slicked down hair parted just so, the turned down corners of the mouth and even a similar chin. Put a mustache on her and she could be his doppelganger. But, it’s more what comes out of her mouth than her looks that bother me. You really are channeling the Queen of Denial lately. Soon you will have usurped the title. There is nothing “so-called” about it, Jack. You need one of those to get your deer, you are NO hunter. Anything else you THINK you might need it for makes you a menace to civilization … a criminal. NZ is known for their sheep. Up until now, we didn’t know how many human sheep are in NZ. And disarmed sheep are easily led to slaughter . . . . .